The primary goal of this program is to recognize and provide incentives for excellence in teaching, especially to those tenured faculty for whom teaching has become the major focus of their professional life. The initiative recognizes that a number of UIC faculty have developed approaches to teaching that are highly successful in terms of student learning and satisfaction. The efforts of such individuals often go unrewarded in the university system and unshared with colleagues within the university. be considered for promotion according to the standard LAS and UIC research criteria that apply to moving from associate to full professor. It is anticipated that the Master Teacher designation would be a permanent change in the terms of appointment. In order to concentrate on these additional responsibilities, Master Teachers will not teach additional courses beyond the increased course load described in (2), either at other institutions or at other units within the university. However, as with all other faculty, they are eligible for course buyouts. If, in the opinion of the unit executive officer and the Dean, additional teaching represents an important opportunity for the faculty member and the College, this restriction may be waived by the Dean. The designation as a Master Teacher is the result of a competitive process that begins with nomination by the executive officer of the faculty member’s academic unit. Departments or programs may nominate no more than one candidate per year as a Master Teacher. The process may be initiated by the executive officer of the unit or by a faculty member. In either case, the applicant is expected to submit to the executive officer a teaching portfolio that includes a teaching statement, sample syllabi and course materials, peer observation reports, student evaluations, and one or more samples of student work that indicate what students learn and the quality of that learning. In addition, the departmental executive officer submits a statement indicating why and how the applicant will be an especially effective Master Teacher. This statement should include the ways in which the applicant will enhance the quality of teaching in the department and in LAS. For example, depending on the applicant’s profile and departmental need, a Master Teacher might take on supervision of courses with large numbers of sections taught by adjuncts, mentoring of junior faculty, or for those whose awards are based on significant innovations, dissemination of their innovative approaches. A candidate who has developed innovative, exciting, and effective forms of instruction. These may, but need not, involve the use of technology. A candidate whose teaching may involve no specific innovation but who, quite simply, demonstrates excellence through knowledge, skill, preparation, and performance. Professor Malchow is an award-winning instructor whose research interests include the study of molecular mechanisms that control the body’s release of neurotransmitters, as well as the cellular and molecular processes that enable visual perception. At UIC, Malchow has taken the lead in teaching lecture courses required of all biology majors, in addition to teaching advanced capstone courses for Neuroscience majors, specifically. He has incorporated state-of-the-art tools and ideas into the upper-level curriculum, which encourage his students to partner with him in research. As a teacher, Malchow sees his role “in large part as acting to assist students in actively constructing their own intellectual framework.” He is the recipient of the UIC Biology Colloquium’s Best Instructor in Biological Sciences Award (2004, 2005, 2010, and 2012-2014), the Silver Circle Teaching Award (2012), the UIC Award for Excellence in Teaching (2010), the UIC Teaching Recognition Program Award (2011-2012), and the Chicago Medical School Council’s award for Excellence in Medical Education (2012). He was named a National Academies Education Fellow in the Life Sciences in 2009 and an American Physiological Society Scholar in 2014. Malchow was named an LAS Master Teacher in 2015. Professor Lippman describes himself as “a teacher of the old school” for whom “learning is a joint journey of insight, knowledge and self-awareness: between a passionate and prepared instructor and students who are provoked, animated, and inspired to learn and to develop.” In his twenty three years at UIC, Lippman has received six Silver Circle awards, the UIC Flame (Alumni Award), the Excellence in Teaching Award, the Teaching Recognition (Portfolio Award) and has been named Honors College Fellow of the Year and, on three occasions, Alpha Phi Sigma Professor of the Year. In his research, Lippman addresses questions of human rights throughout the word; he has studied torture, genocide, the My Lai massacre and the Vietnam war, Nazi medical experiments, the Miranda ruling, civil resistance and terrorism. In the words of one of his many grateful students, Matthew Lippman is “the epitome of what every UIC professor should be.” Lippman was named an LAS Master Teacher in 2008. Professor Reyes studies and teaches clinical and community psychology with special attention to the prevention of high-risk behaviors among children and adolescents from urban minority and low-income status backgrounds. An alumna of UIC, she describes herself as delighted to return as a colleague to her former teachers. She believes “that students cannot be available to learn unless they feel safe to not know. That sense of safety is impossible if students do not experience their instructor as accessible and allied with them in the learning process.” A recipient of a UIC Teaching Recognition Award, Professor Reyes has devoted herself enthusiastically to the psychology department’s Graduate Educational Opportunity Committee (GEOC) and helped to establish a graduate program in Community and Prevention Research. Her work has brought nuance into students’ and faculty’s awareness of issues of diversity. Her students appreciate her efforts to create a “safe” classroom, her extensive examples and her careful attention to their differing ways of learning. Reyes was named an LAS Master Teacher in 2008. Professor Weible has maintained that an instructor’s chief concern should be to facilitate learning. 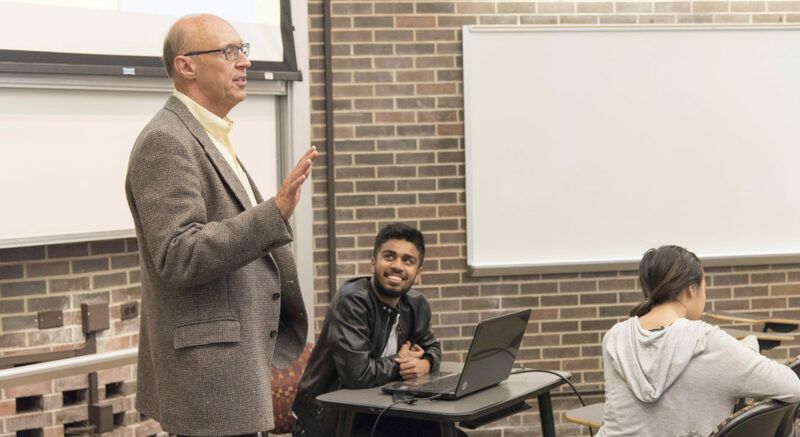 In his twenty two years in the UIC Department of Germanic Studies, Weible has often turned to technology to find new, interesting and more effective means of presentation. In the early 1970s, for example, he developed a successful German reading program for the PLATO IV system; later, he was an early adopter of Blackboard. Weible now uses podcasts to present the core information of his courses in a multi-media environment. He has found that “the ability to have discrete chapters within each episode and to link artwork and websites individually to those chapters creates a very powerful learning tool.” Weible publishes widely and conducts frequent workshops in the field of language pedagogy. As Director of Undergraduate Studies, Weible has created an extensive database that enables the department to provide timely and targeted assistance to students. Professor Astrida Tantillo, head of the Department of Germanic Studies, comments that the ‘breadth’ and ‘richness’ of Weible’s teaching allows students to understand such complex texts as Fassbinder films as well as the broad historical context from which they emerge. Weible was named an LAS Master Teacher in 2008.